Two classic funnies by the genius author of Elmer. No elephants here – but lots of monster fun all round! First you’ll meet Bernard: an unlucky kid whose parents are too busy to listen to him. So how can he tell them that a hungry monster is trying to gobble him up? 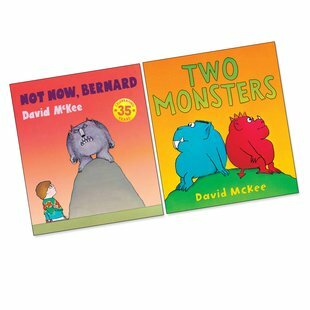 Next comes Two Monsters – and this time, the monsters are quite cute … except when they fight! Wacky chuckles and hilarious artwork: if you’ve only read Elmer, you’re missing out! Explore the best of the rest of David McKee, a master of funny delight. Full of simple lesson for kids – and their parents!